The Hotel Zeus , 3 stars, offers its guests many services, including: air conditioning, solarium, parking, playgrounds, garden, bicycles, entertainment, agreements with beaches and theme parks and much more. Small pets allowed. It is located in Via Carducci, the first parallel of the promenade, very close to the beach and the sea. In a few minutes walk you reach the Leonardo canal, the true historical heart of Cesenatico, where you can find restaurants, clubs, the navy museum and Piazza delle Conserve. RELAX ROOMS : they are located in the nearby Floreale dependence (adjacent to the hotel), equipped with all the listed services to which are added: safe, ceiling fan and hairdryer. Some have a balcony. SUPERIOR ROOMS : like the previous ones, but with extra terrace or balcony. Garden with playground area for children, table tennis, panoramic sun terrace, bicycles, elevator, newspapers, bar and beach towels. For their guests Pets are allowed. CONVENTIONS : the hotel organizes trips and excursions to Santarcangelo, San Marino, Cesena racecourse and the Atlantica Water Park (with free admission), as well as providing free transport and discounted tickets to the Mirabilandia and Italia in Miniatura theme parks. Agreements with the beach. LUNCH AND DINNER : local cuisine with 3-choice menu and homemade pasta. In the hotel : strollers. At meals : baby menu, baby food, bottle warmer, high chairs. The hotel has an agreement with the bathroom 62 Adriatic, which has many amenities including: playgrounds, TV rooms, table tennis, children's playground area, entertainment, library, nursery for children, bathroom for the disabled, WI-FI and much other. Price list is per person per day for one min. Of 3 nights in full board. FAMILY PLAN: 2 + 2 (0-14 years) = 3! - In the case of full board and half-board, un-consumed meals will not be refunded, a packed lunch may be required. - Cancellation: up to the seventh day before arrival, the deposit can be used for a short stay. In case the customer has paid the full amount, however, only the deposit of 30% will be deducted. BOOKING WITH 2 MONTHS OF ADVANCE: -5% ON THE LIST 2019 !! If you book 2 MONTHS earlier than the date of validity of your stay, you will get a 5% discount on the whole amount of the holiday! Take the opportunity to start summer with us. 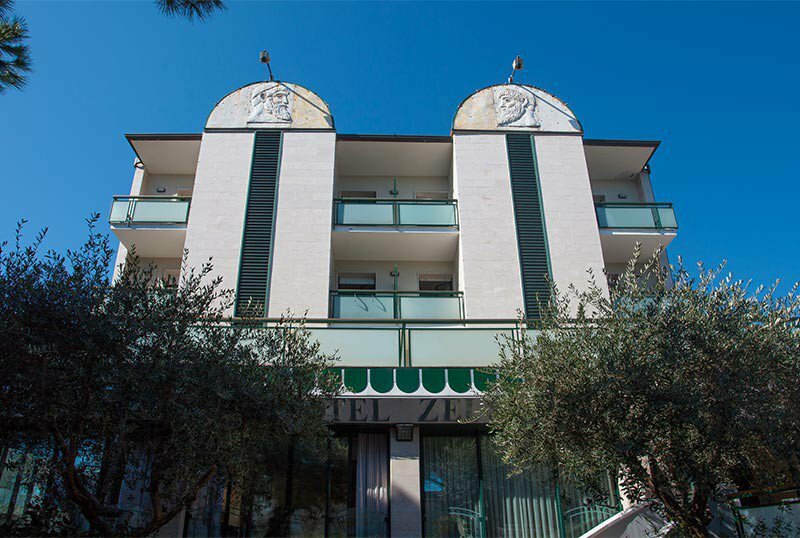 Hotel Zeus awaits you right in the center of Cesenatico a few meters from the sea. From May 20 to June 23, a minimum stay of 5 days in All Inclusive, starting from € 39.00 per person per day. Excellent cuisine, rich buffets and drinks at the tables. Beach service and parking included. Take advantage of special offers valid from 20 May to 22 June 2019! We are waiting for you, run to the Hotel Zeus! Book a stay of at least 5 days and get a 10% discount on the total holiday! Offer valid for stays from 20 July to 3 August 2019. Book a stay of at least 5 days and get a 10% discount on the total holiday! Offer valid for stays from 20 July to 3 August 2019. Hurry up, we are waiting for you! Request a quote now!